Hello New Year! Don't you love new beginnings? I do :) I would give myself many NY resolutions if only I knew I'll going to keep them. I know I can keep them for a week or two, maybe a month but I can not go on the whole year that would actually mean I have to change myself, my behaviour, habits and I do not want to go that far. I rather stay negligent and I'll let things go and flow. Of course I want to be better :) to myself, to others, to blog more, to do things that makes me happy more often. Everyone wants to do that and I guess that is natural. I'll start the year with OMG goal just because I love the name of this linky. I try to link and finish at least 6 OMG projects this year! That's a neat resolution isn't it? For January I picked up cushion making. Two cushions to be precise. I have this pretty fabric and I know exactly to whom am I going to give them. Nothing fancy, just plain pretty cushions. I need to buy appropriate zippers because zipper must match. That's rule No.1 right! Love the fabric! 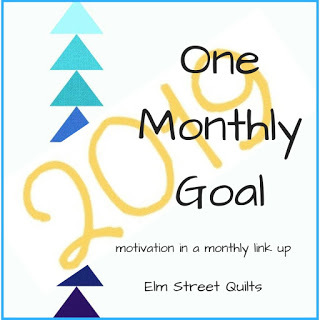 Thanks for linking up with Elm Street Quilts One Monthly Goal and good luck with your project. That fabric will make pretty cushion covers. Habe fun, Vera! I like the OMG, too, and will try to join it every month. Let's see, what happens. I love your philosophy! "I rather stay negligent and I'll let things go and flow." I've been thinking a lot about how I let other people's rules dictate what I want to do. I too want to be more negligent! Yes, rule #1 is the zipper must match, unless it contrasts. Like the blue of one of the deer. I quit making NY resolutions so many years ago, they are things I'm just not going to change so why bother. Although I do the Word Up thing and I do make goals. Enjoy your OMG and good luck with it.